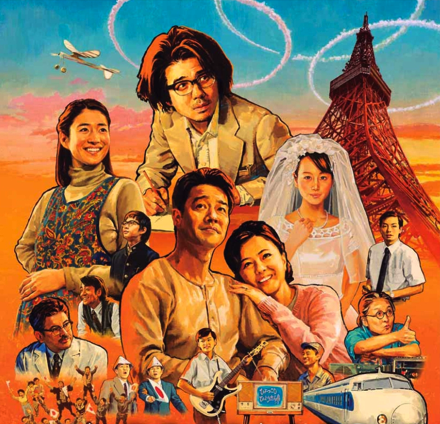 The Japan Foundation Los Angeles, as part of its “Japanema” series, will screen “Always: Sunset on Third Street – 3” (2012, 142 minutes), directed by Takaashi Yamazaki, on Wednesday, Oct. 23, at 7 p.m. at the JFLA Auditorium, 5700 Wilshire Blvd., Suite 100, Los Angeles. The year is 1964. With Tokyo preparing to host the Olympics, the people of Third Street continue to carry on with their lives, as colorful and vibrant as ever. The novelist Ryunosuke Chagawa (Hidetaka Yoshioka) has married Hiromi (Koyuki), and the two now share a happy life with Junnosuke (Kenta Suga). Meanwhile, Norifumi Suzuki (Shinichi Tsutsumi), his wife Tomoe (Hiroko Yakushimaru), their only son Ippei (Kazuki Koshimizu) and their live-in employee Mutsuko Hoshino (Maki Horikita) have gradually expanded their auto repair business, which has gotten an impressive makeover. Every morning, Mutsuko puts on makeup and steps out of her home — all so she can “happen to” run into and say hello to the young doctor, Kotaro Kikuchi (Mirai Moriyama). One day, Hiromi discovers a telegram that Chagawa had hidden. Who sent this telegram? Will Mutsuko’s affections be returned? And what future awaits the people of Third Street? Free screenings are held on the second and fourth Wednesdays of the month. All movies are in Japanese with English subtitles. Reservations are not required. Street parking is available. For parking information, go to www.jflalc.org/about-us.html#parking.